Lately, I’ve been trying my hand at more paleo recipes. I am not paleo, but since researching more into the lifestyle, I’ve been limiting the amount of grains I eat more and more. And the thing is, it wasn’t that hard. Except at breakfast, where I was eating my very-much-loved, fluffy, overnight oatmeal. I should mention that this recipe is a BASE. Therefore I strongly encourage that you include some add-ins! Add-ins (optional): shredded coconut, coconut butter, more nut butter, bananas, berries, nuts, spices, etc. Get creative! Combine cauliflower rice, milk, almond butter, cinnamon, vanilla, and salt in a small pot. Bring to a boil. Reduce to a simmer and let cook for 5 minutes, stirring often. Add in sweetener and add-ins (recommended!). To intensify flavor, let sit before eating. this is awesome! I have really been wanting to incorporate more vegetables in my breakfast! Perfect! I’ve been doing the exact same thing in regard to the paleo thing! 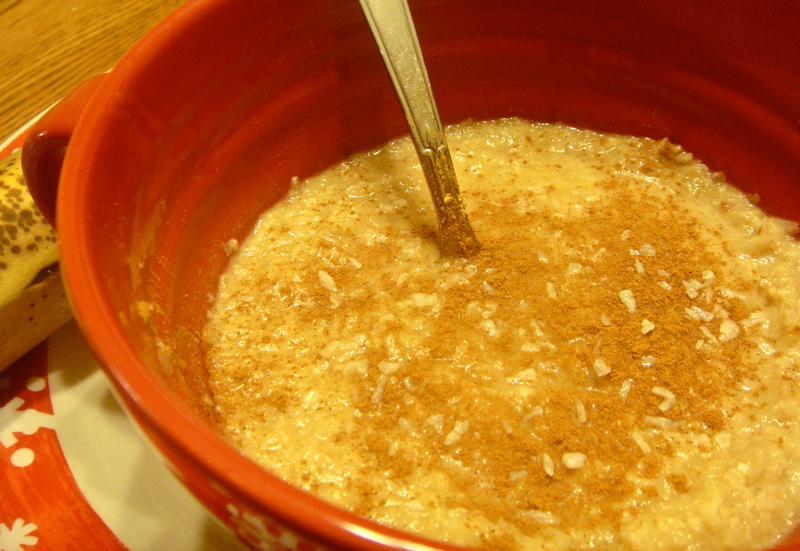 I used to eat oatmeal every single day – but I’ve been trying to eat less grains and fewer carbs in general. This idea is great! Thanks! I’ve been trying so hard to come up with breakfast ideas to replace my oatmeal- it’s probably to hardest habit I’ve had to break!